© 2003 Flyer Media, Inc. In January of this year I received the approval I needed to start building my own hangar: My wife Barbara said yes! As I write this, I have just moved my 1994 Maule MX-7-180A into my new hangar. And while the construction process had its challenges, they all paled in comparison to the initial approval from Barbara. Once that was granted, we were fortunate enough to find a wooded lot on a private airport community in Holt, Fla., called Yellow River. After obtaining a copy of the covenants and restrictions for the community and talking to other owners, it was clear this community allowed hangars without homes. All communities are different. It is important to find out what your prospective aviation community allows in their documents and what happens in practice. By the time we closed, I had already met with a local contractor who would clear the land. My wife and I had marked as many trees as possible to keep on the property while allowing for the placement of the hangar. In a couple of hours on a Saturday morning, his bulldozer cleared our 2/3 of an acre of trees. Another thing I did before the closing was to start comparing quotes on buildings. I compared a variety of designs from traditional, large span steel buildings to arch style buildings to geodesic domes. The environment of the panhandle of Florida played a large part in the questions I asked. This environment requires a building that can meet Florida hurricane building codes, avoid termite problems, and provide some heat relief. After acquiring quotes from approximately six different manufacturers and then adjusting those quotes to compare apples to apples, I was able to select Ludwig Buildings in Louisiana. Equally important in the purchase was the door selection. I was initially surprised to find the door cost nearly half as much as the building. Consider if you need a door at all. I spoke to some well-reputed people who said the primary need for a door is security, not the weather. Unfortunately, I had not considered this advice until after my order had already been placed with Hydroswing. I did follow my purchase decision through by making sure the door manufacturer and the building manufacturer worked out all compatibility details. While both manufacturers were very professional and did not need my input, it gave me peace of mind to get verifications from both parties that things were going to work out. As Ludwig and Hydroswing did their offsite construction, they sent documents along the way that would be necessary to continue construction. 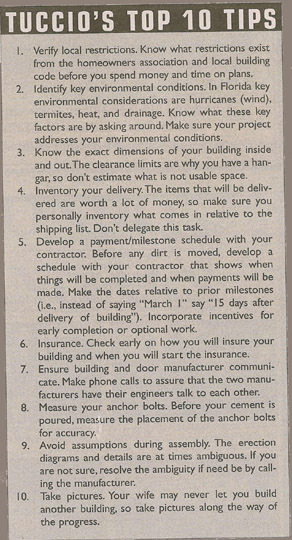 The first key document was the anchor bolt plan, which allowed a local engineer to design the foundation. The next key set of documents were the Florida engineer-stamped plans for the door and building. With the foundation, building and door plans in hand, I went off to the building inspector for my approval. I came across a little resistance since politicians generally don't write a paragraph into the law books for "residential hangars." The building inspectors had to find an appropriate category and in my case it qualified essentially as a shed. While demeaning to my lifelong dream of having my own hangar, I didn't argue. The permit allowed us to get electric run to the property and break ground for the foundation. I had looked around a bit for someone to do the foundation and obtained some references. I met a local contractor, David, who did land clearing, foundation work, and marine construction. I hired him to take on the whole project, including the foundation and hangar erection. David formed out the foundation and installed the anchor bolts according to the plan. I had been advised by numerous people to double-check the measurements of the anchor bolts. I checked eight of the 10 anchor bolts on the job. Unfortunately, it was the two I did not measure that were off by about six inches. David was able to correct the anchor bolts during the pour when he caught the error, but had I executed my responsibility properly, things would have gone smoother. I was fortunate that the delivery of the building and door occurred on the same day. This made for an efficient use of the heavy equipment needed to get the steel off the trucks. Both manufacturers delivered every item in perfect condition. I spent the weekend inventorying every one of the more than 200 items on the shipping list for the building, which was time well spent. Had any items been missing, resolving the discrepancies before erection would save valuable time. The heavy steel of the building was put up using a bucket loader and chains. As one can imagine, the large steel trusses of the building are the heaviest part of the construction and a bucket loader, fork lift or crane is a must. The supporting steel girts (wall beams) and purlins (roof beams) were light enough that they could be lifted into place. Once all the steel was put in place with the hundreds of nuts and bolts, the 2,000-pound door was lifted and welded into place. 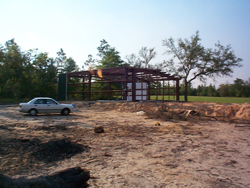 The steel construction took about a month, due to a combination of weather and David's workload. With ideal conditions and a couple extra hands, the steel can be put up in a couple days. When the weather was not cooperating, David was able to finish grading the property and moved about 500 yards of dirt to form a gradual slope and pad in front of the building. With the steel frame completed, it was time to begin the sheeting. Early on I had been advised to insulate the building. Being from Connecticut, I didn't really understand why a building in Florida needed insulation, but I came to understand that the combination of heat and noise was greatly reduced by insulation. The insulation required that it be in place before each piece of sheeting was applied, which adds some time to the sheeting process. Each piece of sheeting for the roof was about 25 feet in length, and about 12 feet for the walls. Handling these large sheets requires some low wind conditions and care to avoid injury. About three months after clearing the lot, the final trim pieces and gutters were in place and I passed the final inspection. That night I proudly moved my plane out of the elements and into the hangar. After breathing a sigh of relief, I looked around and realized I had so many more things to do. I still need to thoroughly clean the yard, plant grass, and adjust the approach to the hangar. I'm going to try to slow down and enjoy these steps. After all, that is part of what "living with your plane" is all about.